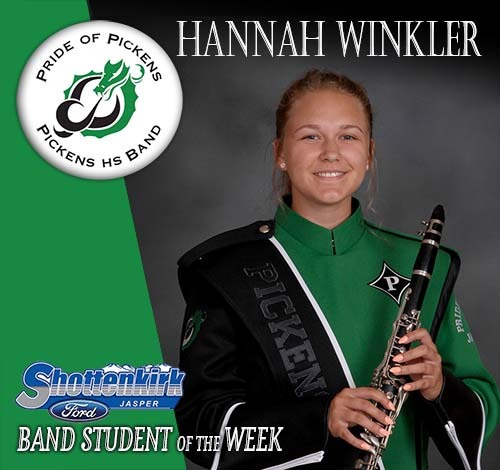 Pickens High School Band Student of the Week is Hannah Winkler. Hannah is a Senior and plays clarinet in the Symphonic Band and the Pride of Pickens Marching Band. Hannah is a great team player and works diligently to perfect her music for band. She is friendly, hard-working, and quick to assist any other student. We are proud of all of the progress Hannah has made since starting with us four years ago and appreciate her work ethic and support of the PHS Band program!